Elizabeth Ann O’Reilly was born in November of 1852 to Thomas and Eliza O’Reilly, the fourth of nine children. In 1860, the O’Reilly family was living in Fairfield, Franklin County, Vermont. Fairfield is in northern Vermont, slightly to the east of St. Albans, and to the south of the Canadian border. Thomas and Eliza O’Reilly had immigrated from Ireland, and had probably entered the United States through Canada. Franklin County, Vermont was full of many Irish and Scots that had immigrated first to Canada, and then crossed the border to America. Probably a younger Irish son with no prospects of inheriting land in Ireland, Thomas O’Reilly came to America and began a new life. The O’Reilly’s were poor, but began a small farm in Vermont and raised nine children. Almost fifteen years after immigrating, both Thomas and Eliza were still illiterate. The O’Reilly’s were a large Irish Catholic family. The kids were all born in Franklin County, Vermont. Mary O’Reilly was born in 1847, followed by John in 1848, Julia in 1850, Elizabeth Ann in 1852, Thomas in 1853, Edward in 1855, Helen in 1857, and twins William and Emily in 1864. By 1870, the family had moved west one town over to St. Albans, a larger town than Fairfield. The outskirts of St. Albans were still rural, and Thomas O’Reilly continued as a farmer there, maintaining a small farm amongst other agricultural immigrant neighbors of French Canadian, Canadian, and Irish descent. Click here to see St. Albans and Fairfield, Vermont. Click here to see Swanton, VT, close to the Canadian border and St. Albans, VT to the south. Elizabeth O’Reilly soon met and married John Mahon of Swanton, Vermont. A man almost twice her age, he was born in February of 1830 in Ireland to Daniel Mahon (b. 1800 in Ireland) and Mary Conneley (b.1806 in Ireland), who immigrated from Ireland in 1834, when John was still a toddler. There may have been other Mahon children were born and died young or went unrecorded. For certain, John Mahon had one much younger sister. His mother Mary Mahon gave birth to Jane Mary Mahon (refered to by many nicknames over her life – most commonly Jennie) in 1846. In 1850, the census records 20 year old John and 5 year old Jane living in Swanton, Vermont with their parents on a farm. Two adult Irish farm laborers were living with them, 25 year old William McCue and 47 year old Michael Larrand. John Mahon was a skilled carpenter and a farmer. By 1860, John was living with and helping his aging parents with their farm in Swanton, and doing independent carpenter and joining work in Franklin County. In 1870, John’s sister Jane’s husband, Jacob Coulombe, passed away, leaving her with two toddler sons and an infant daughter who had been born earlier that year. Jane, her three young children, John (now 40 years old) and their father Daniel all lived under the same roof in Swanton. Their mother, Mary (Connelly) Mahon, had passed away three years earlier in 1867 and was buried in the Swanton Catholic Church cemetery. Irish Catholic immigrants found a welcoming community along the Canadian border, unlike further south in Protestant New England, because of the long history of French Catholic Canadian settlement. Jesuit missionaries had posts in the area back to the earliest colonial days. 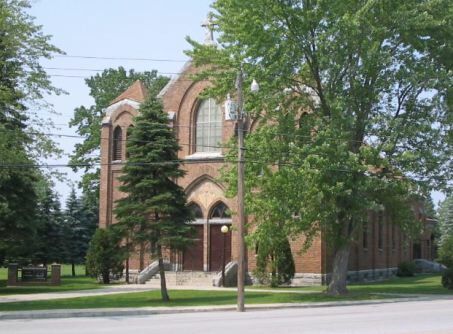 The Nativity of the Blessed Virgin Mary Roman Catholic Church in Swanton was the first Catholic church in town, and that is church the Mahons attended weekly. The church had been built in 1836, but received its first permanent priest in 1854. Prior to that, Catholic priests from nearby towns in Canada and St. Albans, VT would travel to the towns in Franklin County to preach. In 1851, the Swanton town hall & academy burned, from 1854-55 a severe drought caused severe forest fires, in 1858, Turillo’s hotel and the Catholic church burned. After so much destruction from fires, Swanton formed its first fire department the following year, in 1859, and rebuilt the Catholic church. The cemetery beside the church hosts a wide variety of French and Irish surnames, of which John’s mother, Mary Mahon, was just one. At the rather late age of 45, John Mahon married 23-year old Elizabeth O’Reilly in 1875 and they went on to have eight children, who were all baptized in the Swanton Catholic Church, with many Irish and French Canadian friends and family from the parish serving as godparents (almost all of the O’Reilly aunts and uncles served as a godparent to one of the Mahon kids!). Laura Catherine was born in 1876, John Francis in 1877, Mary in 1879, George Frederic in 1880, Thomas William in 1881, Helen Anna in 1882, Edward Daniel in 1884, and Daniel Patrick in 1889. John’s father Daniel Mahon continued to live with John’s growing family in Swanton until Daniel’s death in 1882. 1881 was a sad year for the Mahons. In March, five year old Catherine Mahon became ill and died. Several weeks later, Elizabeth Mahon, still mourning the death of her oldest child, gave birth to her fifth child in April. She named him Thomas, in honor of her father, but a mere five months later, Thomas William became sick and died at the age of five months in September of 1881. Three more Mahon children would be born after 1881, but losing two children in one year was a terrible loss for the Mahon family. John and Elizabeth Mahon moved their family to nearby Fairfax, Franklin County, Vermont by 1900. John and George were living independently as boarders nearby, while Mary, Helen “Nellie”, Edward, and Daniel still lived at home. But another family tragedy would unite the family. John Mahon died probably in 1901. All of the Mahons then uprooted their lives to an entirely foreign state and city – Boston, Massachusetts. Coming to Boston, a large, bustling city, from a lifetime of rural farming in a small northern Vermont town must have required significant adjustment for the Mahons. I have no stories or records for why they came to Boston. Perhaps they knew someone in Boston who offered them assistance. Whatever the case, Elizabeth and all of her children relocated to Roxbury by about 1902. City life was hard for some of Elizabeth’s children. Her daughter Mary became pregnant, and gave birth to an illegitimate daughter, Catherine Mahon, in April of 1903. Boston’s well-known Catholic St. Mary’s Infant Asylum and Laying-In Hospital was little Catherine’s birth place and death place, and possibly Mary’s as well. Catherine died a month later in April at the hospital and was buried in St. Joseph’s Cemetery in West Roxbury. Mary Mahon died before 1910, possibly as a result of her giving birth. Elizabeth’s other daughter Helen Mahon fared better. She met and married Eugene McCarthy in 1907, a young man originally from Marlborough, but working in the city. The McCarthy siblings and Mahon siblings shared dinners and special occasions with each other, and Edward Mahon soon fell for Eugene’s younger and only sister, Mary McCarthy. They married in 1910. Elizabeth Mahon and her family boarded her sister Julia (O’Reilly) McGinley in 1910. They lived at 6 North Avenue, in Roxbury. Perhaps it was her sister Julia who first arrived in Boston and encouraged her widowed sister Elizabeth to move to Boston. Elizabeth died between 1910-1920 in Boston, in her 60s. Her son George Mahon then went to live with his aunts who had both moved from Vermont to Boston, Julia (O’Reilly) McGinley and Emily O’Reilly, and they ran a boarding house in Boston. From the Canadian border to the heart of Boston, Elizabeth (O’Reilly) Mahon raised a large family, and faced countless joys and sorrows along the way. Those stories often become lost over the years. My grandfather had heard that his great-grandparents (John and Elizabeth Mahon) were from Vermont, and that there was a family plot (perhaps there is a Mahon or O’Reilly plot somewhere in Franklin County, VT), and they had been in Vermont “forever”. But alas, there were no Puritanical roots or colonial settlers in this family line! As far as Irish immigrants go, however, the Mahon and O’Reilly stories are fascinating to consider both their relatively early timeframe of immigration (1830s and 1840s for Mahons and O’Reilly’s, respectively) and their route of migration, from Ireland to Canada to America.